Heat oven to 425°F. Place miniature paper baking cup in each of 36 mini-muffin cups, or grease bottoms only of muffin cups. In medium bowl, stir Muffin Mix, milk, oil and eggs just until blended (batter may be lumpy). Spoon about 1 tablespoonful batter into each muffin cup so cups are about two-thirds full. Bake 10 to 12 minutes or until golden brown and tops spring back when lightly touched. Cool 3 to 4 minutes; remove from pan. Squeeze Glaze packet about 10 seconds (do not microwave). Cut off tip of 1 corner of packet with scissors. 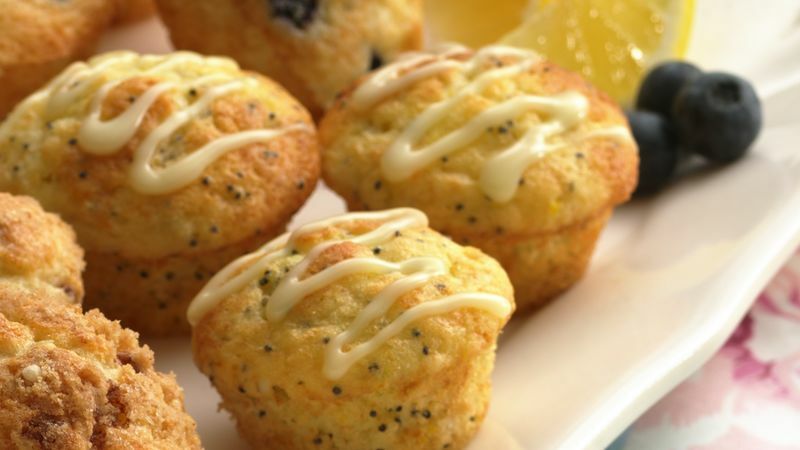 Drizzle over muffins. Filling muffin cups can be easy and fuss free! Place the muffin batter in a resealable plastic food-storage bag. Snip the corner, and squeeze batter into muffin cups.